Get ready to hang ten with this one of a kind Larimar Color Wave Charm. 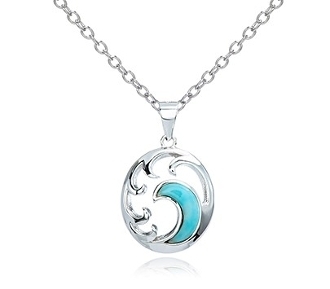 The charm is sterling silver and features a Larimar color stone to represent the blue wave. With the stone being a larimar color, it promotes the idea of relaxation and calmness, just like listening to waves crashing onto the shore. Let all your worries drift away while wearing this beautiful wave charm.